Just when you think you’ve tasted it all, they come up with something new. 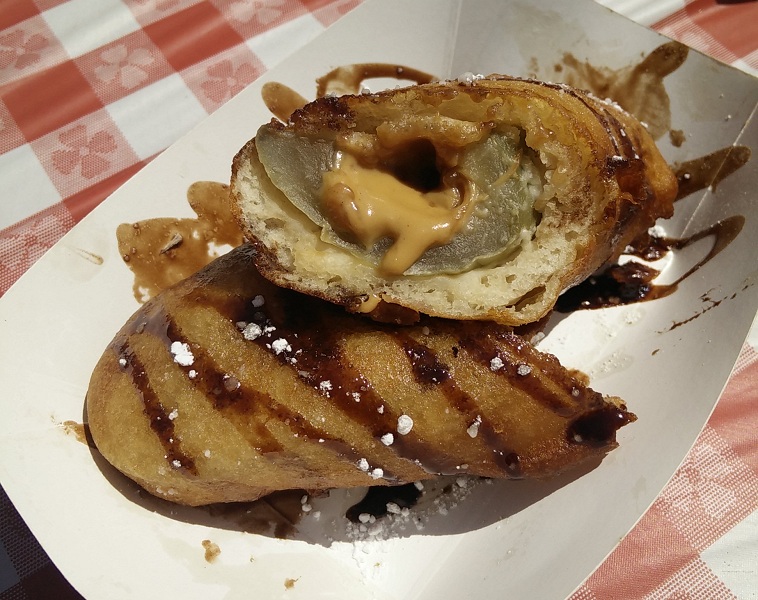 How does a deep-fried peanut butter pickle grab ya? Then how about a spicy peanut butter and jelly burger, complete with bacon and Sriracha? It’s still a couple of months away, but our friends over at Fairplex are already thinking about this year’s Los Angeles County Fair. Well, about the food, at least. They are pondering what everyone’s favorite fair food is, and they’ve also got a contest regarding one of Chicken Charlie’s (in)famous concoctions. Guess correctly and you could win a “vintage” fair T-shirt. I know the answer, but if I told you, that would be cheating. Click here to share your favorite fair food and enter the contest. Dine 909 was among a select group of participants to preview food selections from this year’s L.A. County Fair. Chicken Charlie’s, of course, whose new creations for this year are FryBQ Ribs and Totally Fried Kool Aid. Then there were the food trucks. On hand were Calbi, Piaggio and Crepes Bonaparte. We also got to sample from Big Bubba’s Bad to the Bone BBQ, Old Tyme Ice Cream Bars, Kokopelli’s Indian Fry Bread, Thai BBQ and South of the Border. What would you do for a deep-fried Klondike bar? I can’t believe I ate the whole thing…and then kept going! As has become a tradition here at Dine 909, we shlepped out to Pomona on Sunday to the Los Angeles County Fair to see what’s new at the food booths. This year, we were pleased to see that this year the fair has invited some of L.A.’s most popular (and trendy) food trucks to park inside the grounds. We’re also glad that Chicken Charlie’s hasn’t been resting on their laurels. They’ve got a couple of new fried concoctions for us to try this year. 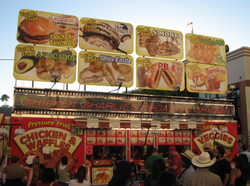 Ah…the sights, the sounds, the smells and the tastes of the Los Angeles County Fair! I’ve been a frequent visitor the fair since elementary school, when the school district would hand out free tickets to every child in the hopes that a parent or two would be necessary to chaperone that child (and pay admission price to get themselves in! ).